With barely a chill in the air I was ready to cook up a batch of soup. I love soup – any kind. Tomato. Broth based. Creamy. Preferably chunky. Hot. Cold. You get the idea. 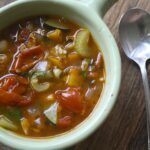 I love vegetable soup and Ellie Krieger has a dynamite Tuscan Vegetable Soup that I often serve with bread and salad. I wanted a vegetable soup that remained as light and feel-good healthy as Ms. Krieger’s yet was a bit more substantial and chunky. In a large pot or Dutch oven, heat olive oil until shimmering. Add onion, carrots, celery, zucchini, garlic, herbs, salt and pepper. Cook vegetables, stirring frequently, until onions become slightly translucent and vegetables are just beginning to cook, about 5-8 minutes. Add tomatoes, water and bay leaf. Bring soup to a boil then reduce to simmer and cook for 15 minutes or until carrots are fork tender. Add farro and beans, cover and simmer until farro is tender, about 15 minutes. Season with salt and pepper to taste, remove bay leaf and serve hot. I call for dicing your vegetables. I would say I like to “large” dice because as I said, I like my soup chunky. Cut depending on what you like, if you like your veggies cut smaller, cut down on simmer time about 5-10 minutes. I call for dried herbs because this is what people have on hand most often. I like to swap out fresh for dried, I just up the parsley to three tablespoons chopped. Leave fresh basil out until right before serving. Other fresh herbs that are great in this soup include rosemary, thyme and sage.